Enjoy modern comforts at affordable rates at this Microtel Inn and Suites by Wyndham Pleasanton hotel conveniently located off Highway 97 in the heart of the Eagle Ford Shale and Oil Exploration. This lodging is just a mile from the South Texas Regional Medical Center, and near many local restaurants. Take a day trip to Sea World, Six Flags Fiesta Texas or San Antonios historic River Walk. Ideal for business and leisure, this lodging offers a 24-hour business center with computer access, and fax and copy services. 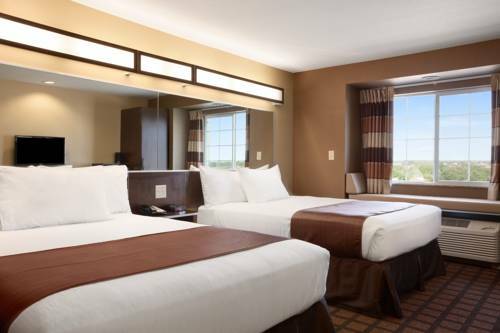 Take advantage of the 24-hour guest laundry services, complimentary car and large-vehicle parking. Wake up to complimentary continental breakfast, and take care of business with complimentary wireless Internet access. Stylish guest rooms include pillow-top mattress, self-controlled heating and cooling, hairdryer, microwave and refrigerator. Pets are welcome at this newly-built lodging.